Need to Sell An Inherited House? Can you Sell an Inherited House Before Probate in Omaha? Find out whether you can or can't sell an inherited house before probate is finalized in Nebraska or Iowa. Many residents of Omaha, and the entire State of Nebraska for that matter, find themselves looking for information about how to sell an inherited house before probate. This is either because they have inherited a house through a will or have been named as executor in this document. This is a situation that raises the need to find answers to several important questions. One of those important questions is "can you sell a house before probate is granted?" Can You Sell an Inherited House Before Probate? Individuals who ended up with an inherited home often can’t or don’t want to keep it. It could be their parent’s home where both parents are now deceased. One option is to put the house on the market but the question is, "can you sell an inherited house before probate?" If a will exists chances are a family member who is close to the deceased is aware of this important document. It may be that a particular person is named as the executor in the will. The executor has the duty and obligation to see that the last wishes as outlined in the will are fully carried out. If property is involved in the estate, such as a house, this most likely will have to go through a probate process. Individuals who have inherited a house may not realize that it has to go through a probate process. They may attempt to put the house on the market for sale. If they use a Realtor to attend to this, an experienced agent will know that the house must go through the "selling a house before probate" process. This is in order for a sale to be legal. The probate laws are in place to ensure that the wishes of the will are carried out as intended. This is the main reason why selling a house before probate is not allowed in many states. Luckily, in Nebraska there are some controlled exceptions to this. There is an alternative to go through the standard probate procedure. This is using a process called "Muniment of Title". This is applicable when a will was left but there were no debts secured by real property. This alternative process is done by validating the will in a local county court. Once this court has approved the validation, property titles can be transferred to the beneficiaries. There is also an alternative that should be looked at in Nebraska (Disclaimer: check with a local attorney to see if this is applicable to Nebraska). This is for those who are looking at selling a house before probate. This is called Affidavit of Heirship. This can be utilized if the property in the estate only amounted to real property, i.e., a house or houses. With this process the property titles are transferred to the heirs. It involves two individuals who have nothing to gain from the estate sign the affidavit. Once this is done this document must then be filed with the deed record department in the local county where the house is located. Can You Sell an Inherited House Going Through Probate? 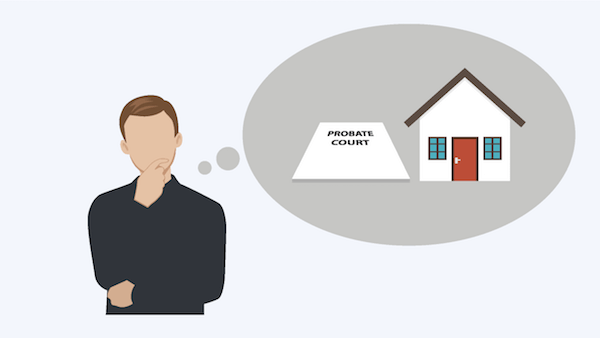 The next question that often is raised is can you sell a house that is already going through probate? It may have been discovered that selling a house before probate is not allowed in many states. It is important to really know the laws of the state in which the house resides. In Texas for example, the answer to the question of whether you can sell a house going through probate is yes. There are specific steps that must be taken in order for the sale to be legitimate. The property has to be appraised by an independent certified appraiser. Often an experienced realtor in probate sales will be able to recommend one. For the probate petition it requires some information to be filled in. This applies to both selling a house before probate and selling one during probate. This includes all the details that pertain to the proposed sale. You may also have to outline the method in which the home will be sold. Once completed properly and submitted to the courts you then have to wait for court approval. A sale before this petition will not be considered valid. This answers the question can you sell a house before probate is granted. It also shows that when it comes to Nebraska like the other states there are specific rules that must be followed. Potential buyers must be told that a sale can only be finalized after court confirmation. Buyers will have to obtain confirmation of the sale from the court handling the probate case. The public must be informed about the sale that has taken place during the probate period. This is done by running an ad about this in the local newspaper. Can An Executor Sell an Inherited Before Probate? Individuals who become an executor may find different types of property that needs to be dealt with. They first have to understand what their role as executor is. Being an executor doesn’t mean this individual inherits any of the property. Sometimes an executor is named by the deceased. At other times may be appointed by the courts. In most cases probate is needed. If so then the executor or executrix must attend to this either doing it himself or retaining a lawyer to do it. One of the questions raised by an individual with this responsibility is, "can an executor sell an inherited house before probate?" It may be that the inheritors of the will want the sale of the house done quickly so they can receive their share of the sale that was allotted to them through the wishes of the will. Throughout most states the probate rules and regulations are pretty much the same. There are some differences that do exist in some of the states about selling an inherited house before probate. Nebraska for example, is considered to have easier rules to adhere to when it comes to probating. In Nebraska, the will can direct the executor to go after independent administration. This makes the process much easier. It gives more freedom to the executor outside of the control of the court. If this is granted the executor does not have to ask permission from the court to sell the house named in the will. Another option is to sell an inherited house to a cash house buying company. You won’t have to worry about any repairs, you save thousands on agent commission costs and you can receive a no-obligation cash offer in just 24 hours. Red Ladder Property Solutions gives you a cash offer within one day and you can close whenever works best for you. You can have your Omaha house sold in a week! If you need to sell your Omaha area house fast and would like to get a no-obligation cash offer, call us now at 402-578-4003 or 402-915-1179. Whether you decide to sell your house to us or not, we would like to help answer questions you might have about the process. Lucky for you, we buy houses in Omaha, Council Bluffs and the surrounding area. Give us a call at 402-578-4003 or 402-915-1179 or fill out the form below to get started. We look forward to talking with you. Can you sell an inherited house before probate is finalized in Omaha?